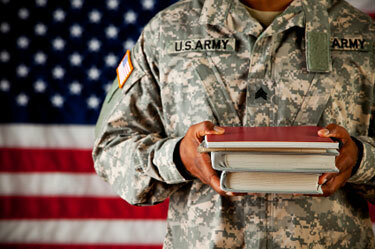 This guide has resources for Cincinnati State's Student Veterans & Student Soldiers. Welcome Student Veterans & Student Soldiers! Students may meet 1:1 with a reference librarian to plan a search strategy and review research resources. Sessions are available whenever the library is open by walk-up, phone, email, or chat. If lengthy assistance is needed, consider calling in advance to schedule an appointment. Contact info for all methods can be found on the Getting Help page. Individuals with disabilities can have help pulling materials off the shelves. If you need assistance, please stop by the main desk or call in ahead of time (513-569-1606). If you choose to call, you will need to disclose that you have a disability that prevents you from pulling materials on your own since we typically do not offer this service to students. Library staff are available to show students how to use the copiers and to problem solve basic issues on the computers. They will also help you print, scan or copy materials if a disability prevents you from doing so on your own. Please stop by the main desk and let us know if you need assistance. The Library's public computer stations (PC's) are equipped with Common Access Card Readers. Please note: the Library's laptops are NOT. All students may check out laptops and headphones with their surge card for two hours at a time. Library laptops and desktops are equipped with an Ease of Access program that allows users to magnify the screen, use an onscreen keyboard, and turn on a screen reader among many other setting changes. This program is accessed by clicking on the access icon (small circle with counterclockwise arrow) on the bottom left corner of the log in screen or by selecting the windows button and the letter "u" when in any screen. Two group study rooms are available on each of the library balconies (there are four total). The two on the right balcony are accessible by the elevator. Typically students are only allowed to check out materials with their own surge cards. If you are unable to come into the library due to a disability, you can identify another student that has permission to check out materials on your behalf. Please call the circulation desk at (513)569-1606 before your first check out to set this up.